In this Thursday, Feb. 22, 2018, file photo, Sen. Mike Lee, R-Utah, speaks on the Senate Floor at the Utah state Capitol in Salt Lake City. Lee is the only lawmaker on the list of 25 names President Donald Trump is considering to fill Supreme Court Justice Anthony Kennedy's seat on the court. 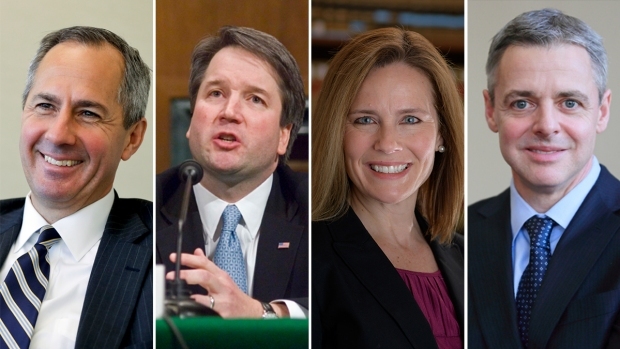 As President Donald Trump considers his next Supreme Court pick, some Republicans in Congress want him to consider pulling from their ranks on Capitol Hill. GOP Sen. Ted Cruz of Texas suggests his conservative ally, Sen. Mike Lee of Utah, would be "the single best choice" Trump could make to fill the vacancy. Republican Sen. Tim Scott is making a pitch for his best friend in Congress, Rep. Trey Gowdy, a fellow South Carolinian. "I hope that the president will be open to that," Scott said on CNN. Nominating a lawmaker and seeing him or her confirmed would be unusual. A veteran of either the House or the Senate hasn't joined the court for nearly 70 years. Only a couple dozen members of Congress also served on the court in its history. But for now, only one lawmaker — Lee — is on the list of 25 names Trump is working from to fill the seat of retiring Justice Anthony Kennedy. Cruz says unlike other Republican nominees who have proven to be liberal "train wrecks," he's confident Lee, among his favorite colleagues in the Senate, "would be faithful to the Constitution and the Bill of Rights." Lee is also staunchly opposed to abortion. But even though Lee is championed by conservatives as a strict constitutionalist, he could face obstacles to winning the president's favor. Chief among them is that he never backed Trump for president during the 2016 campaign. There have been no indications from the White House that Lee is among the handful of top names receiving serious consideration. The same goes for his brother, the Utah Supreme Court justice Thomas Lee, who was also on Trump's initial list of possible court nominees. Trump on Monday interviewed four prospective nominees for the court and said he expected to speak with a few more. The White House did not provide their names. The president said the candidates he met with are "outstanding people and they are really incredible people in so many different ways, academically and in every other way." Sen. Lee's office would not say if he was among the candidates who met with the president. Nevertheless, Lee, who started watching court proceedings on TV as a 10-year old and went on to clerk for Justice Samuel A. Alito, has made clear he wouldn't dismiss an overture to join the court. "If somebody asked me if I would consider that, I would not say no," he said. Trump plans to announce his nominee on July 9. The quick timetable could help Senate Republicans confirm a justice before the court's term begins in October. While Lee has been floated as a nominee for some time, the same cannot be said for Gowdy, who is chairman of the House Oversight Committee. Scott, in making the case for Gowdy, said the former prosecutor is so fair that he has angered both Democrats and Republicans. "A guy who will call balls and strikes and not choose a side, even when he's an elected member at this time in our nation's history, that's hard to find," Scott said. Scott and Gowdy are close friends who have dinner together several nights a week. They also wrote a book about their friendship, "Unified," that was released earlier this year. Gowdy led the congressional investigation into Hillary Clinton's handling of the Benghazi attack in Libya and more recently distanced himself from Trump's characterization of the Russia probe into election interference as "spygate." Fellow lawmakers are rooting for their Capitol Hill colleagues. Sen. Marco Rubio, R-Fla., told reporters last week he was personally hoping Trump chooses Lee. "He'd be great," Rubio said.